After serving the two guests food and wine, Baucis noticed that, although she had refilled her guest's beechwood cups many times, the pitcher was still full. 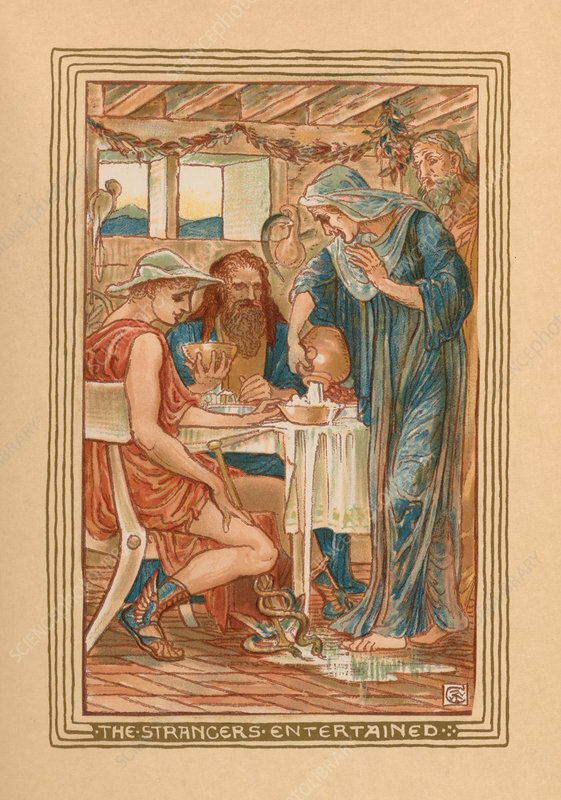 The Miraculous Pitcher, recounts the story of Baucis and Philemon providing food and shelter to two strangers who were Zeus and Hermes in disguise. Baucis and Philemon were rewarded by the gods for their kindness, they were promised never to live apart from one another. Nathaniel Hawthorne (July 4, 1804, May 19, 1864) was an American novelist, dark romantic, and short story writer. His, A Wonder-Book for Girls and Boys, first published in 1851, is a children's book in which he retells several Greek myths. Walter Crane (August 15, 1845, March 14, 1915) was an English artist and book illustrator. He is considered to be the most influential, and among the most prolific, children's book creators of his generation. Printed at the Riverside Press, 1893.